For your convenience to contact HSBC We have provided all possible information of HSBC. You can contact HSBC on the given phone number +44 20 7991 8888. To know the address location of HSBC it is also presented here 8 Canada Square, London E14 5HQ, United Kingdom. Contact them by sending email to HSBC you will find an email address here . To know more about HSBC, go to their website www.hsbc.co.uk and collect all possible information from there. You can contact them from their website also. If you have any comment to post or you want to register a complaint against HSBC, you are advised to go to the below box and post your view there. HSBC is the world's leading financial institution that provides a wide collection of banking and financial services to individuals and businesses. The company began its operations in the 1865 year as the Hongkong and Shanghai Banking Corporation under the guidelines of Thomas Sutherland. In the 1991 year, it has become public holding company, and adopted the name HSBC Holdings PLC. HSBC Holdings PLC., provides different types of banking and financial services to the people. Hsbc Holdings PLC., provides different types of banking services such as saving & current accounts, Credit Card services, investment management, business banking, personal banking, IRA (Individual Retirement Accounts), royal checking, and many more under the HSBC Bank PLC, division. In addition to this, the company provides a wide range of loan services like personal loan, home loan, vehicle loan, student loan, etc. Apart from this, HSBC Holdings PLC., offers several types of insurance services such as vehicle insurance, home insurance, travel insurance, life insurance, group insurance, student insurance, and many others. HSBC Holdings PLC., also offers its E-Banking services including Internet banking, Mobile banking, IMPS, and SMS banking to their customers. Additionally, the company provides tax & pension and retail banking services. HSBC Holdings PLC., has divided its business into six segments namely- commercial banking, international banking, private banking, retail Banking, investment banking and wealth management. The company provides investment banking and financing solutions to several companies, and institutional clients including corporate banking, investment banking, capital markets, trade services, payments and cash management, etc., under the Global Banking & Market division. The Global Banking & Market division operates approximately 640 branch offices located in nearby 60 countries and territories worldwide. 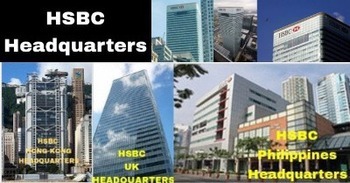 HSBC Holdings PLC., serves worldwide with its several affiliates Subsidiaries including Hsbc Bank plc, HSBC GLT India, HSBC Bank Middle East, HSBC Bank USA, HSBC Mexico, HSBC Bank Brazil, HSBC GLT Malaysia, and HSBC Finance. It is listed on New York, Hong Kong and Bermuda Stock Exchanges. HSBC Holdings PLC., is consider as the second-largest financial company in the United Kingdom. The company is also associated with 216,000 shareholders over 130 nations. In the August 2002 year, HSBC took possession over the Grupo Financiero Bital (a Retail Bank) by paying approximately $1.1 billion. In order to expand its business, the company also purchased Marks & Spencer Retail Financial Services Holdings Limited in the December 2004 year by paying approximately £763 million. It also took possession over the Chinese Bank (located in Taiwan), and IL&FS Investment (Indian retailing broking firm) in the December 2007 and May 2008 year respectively. HSBC Holdings PLC., distributes it's a wide collection of finance and banking products and services through its large network of approximately 6,600 branch offices located in around 80 nations and territories throughout the Africa, Asia-Pacific, Latin America, Europe, the Middle East, and North America. The company serves its services to more than 55 million customers worldwide. HSBC Holdings PLC., is one of the world fastest growing companies in the banking sector. According to the details of December 2013 year, HSBC Holdings PLC., operates nearby 1,132 branches located in the United Kingdom. www.hsbc.co.uk/1/2//contact-and-support/branch-locator By visiting above given web link, the people living in the United Kingdom can find-out the HSBC branch location, Hsbc Business specialist, and HSBC ATM branch location. HSBC is the sponsor of many sports teams including Jaguar Racing Formula One, AS MonacoC.F. Pachuca,Telford Raiders New South Wales Waratahs etc. Initially, the HSBC financial institution was founded in Hong Kong, and after few years it established its main administrative office in Canary Wharf, London, United Kingdom. The complete HSBC headquarters address is 8 Canada Square, London E14 5HQ, United Kingdom. www.hsbc.co.uk/ HSBC Holdings PLC., offers several online services such as make payments, transfer money, view transaction history, manage account & transactions, and much more through its above given official website. In order to access given above HSBC online services, the customer have to register the account on the above given HSBC official website. +44-20-7991-8888 For any complaints, suggestions, and issues related to the HSBC products and service, the customer can contact to the HSBC representative by dialing above written HSBC head-office customer service number. According to the record of 2013 year, the company holds the strength of approximately 254,066 employees, and had Revenue nearby US$ 68.18 billion. 1800-103-4722 For any queries related to the HSBC services and products, the customer can contact to the HSBC Holdings PLC., customer help care center by dialing above written HSBC toll-free helpline number. The above written HSBC toll-free number is available 24 hours a day to solve the problems or issues of the customers. 0800 277 377 (For queries related to the Home /Student Insurance Services) 0844 871 2330 (For Car Insurance claims) For queries related to the home insurance, student insurance, and car insurance services, the customer can contact to the company's representative by calling at given above HSBC helpline numbers. +44-20-7992-4880 HSBC Holdings PLC., provides fax facility for the customer convenience. The customer can fax details to HSBC headquarters by using above given HSBC head-office fax number, and send their documents or files in a easy and secure manner. The working hours of the HSBC UK head-office customer help center are Monday to Friday from 8:00 am to 9:00 pm, and Saturday and Sunday from 9:00 am to 5:00 pm. www.hsbc.com/about-hsbc/structure-and-network/country-contacts By visiting above given web link, you can find the HSBC Holdings PLC., several branch locations address, telephone number, and fax number. +1-(212)-525-5600 (HSBC USA Head-office Number) +1-(224)-544-2000 (HSBC Finance Corporation Numner) +1-(716)-841-7212 ( HSBC Bank USA) The people living in the United States, can contact to the HSBC USA head-office help care center by dialing above written HSBC USA head-office customer service number. +1-(716)-841-2034 You can fax details to the HSBC Bank USA head-office by using above given HSBC Bank USA headquarters fax number, and send their documents. www.hsbc.co.uk/1/2//popups/hsbc-careers-interstitial www.jobs.hsbc.co.uk/14-en/HSBC.aspx The individual can get all the information related to jobs, and other on going recruitment opportunities of the HSBC Holdings PLC. Follow the above written HSBC job career link for all the latest information related to job, career and public notice. Search in google HSBC with the name Google Plus, Facebook, Twitter, linkidin Pages and you will find more information on these pages. Search in google like HSBC Google Plus Page. When you call to HSBC, ask for toll free number to enjoy charge free calling. At the first step When you call to HSBC please do not forget to tell them that you have found their contact number on findbusinessaddress.com.